What are the most important events in the collective environmental memory of humanity? In the spring of 2013 a group of environmental historians from around the globe was confronted with this very question. They were asked to nominate one event that, in their opinion, should be part of this collective memory. This was part of a survey for a special issue of the journal Global Environment on environment and memory. The twenty-two entries that were returned provide an interesting window in what professional environmental historians regard as world changing environmental events that should be remembered by all of us. The events suggested are a colorful mix including animals and bombs, dust and climate, organic and mineral resources, the old conservation movement and the new post-1970 environmental movement. In spatial terms, events were scattered over all five continents as well as the entire globe. The guest on this episode of the podcast is Frank Uekotter, the organiser of the collective environmental memory survey. He discusses what the spatial and temporal distribution of the entries as well as the obvious silences and omissions tells us about our historical imagination and the present direction and focus of the discipline of environmental history. “What Should We Remember? A Global Poll Among Environmental Historians“, Global Environment, 11 (2013), pp 184-214. Compiled and introduced by Frank Uekötter. The power of the wild is an idea that has been important in western thought as a place of refuge or separation where we can feel the power of nature. It is a place where humans are not in control and their power is limited. Using nature as a category of power creates a dichotomy between humans and nature, which is problematic because humans are very much part of eco-systems in which we live. Is it then valid for historians to invoke models of power dynamics to study past interactions between humans and nature? This was one of the questions considered at a workshop held at Wicken Fen in Cambridgeshire, England in April 2013. The participants of the workshop also examined if a nature reserve like Wicken Fen can be made wild again, a process called re-wilding. In episode 53 of this podcast series Dolly Jørgensen argued that no re-wilding is needed but that the wild is all around us, even in urban settings. In this episode of the podcast Paul Warde, reader in history at the University of East Anglia, argues that the experience of the wild is hard to find in an urban environment, even an urban park or in a nature reserve in densely populated England. The question is then if rewilding of an heavily dominated human landscape like Wicken Fen is possible and can be returned to a “wild state”. This desire of rewilding Wicken Fen also led to the question whether such a rewilded area would be truly wild. Dolly Jørgensen, Reflections on rewilding, Return of Native Nordic Fauna, 30 September 2013. Includes the video mentioned in the podcast. An imaginary scene depicting of the arrival of Jan van Riebeeck in Table Bay showing the land, its people and the environment that the Europeans so totally misread. The European settlers were not able to mange the South African environment within its limits because they misinterpreted the nature of African nature and it created a legacy that still endures. (Painting by Charles Bell, 1813-1882). Source: Wikipedia. On 14 and 15 November 2013, the 44th symposium of the Australian Academy of the Humanities was held at the University of Queensland in Brisbane. This year the meeting focused on the burgeoning field of the environmental humanities and the symposium was entitled The question of nature. The first two sessions of the symposium were devoted to an important component of the environmental humanities: environmental history. The symposium opened with a keynote address by leading environmental historian Jane Carruthers, Emeritus Professor at the University of South Africa. Her talk, entitled “The question of nature, or the nature of the question?”, explored the nature and purpose of environmental history in South Africa. In this episode of the Exploring Environmental History Podcast professor Carruthers argues that the European settlers were not able to manage South Africa’s environment within its limits because they misinterpreted the nature of African nature and it created a legacy that still endures. She explores why and how environmental history has an urgent role to play in addressing this legacy and should contribute to discussions about issues such as environmental and social resilience and sustainability as well as social justice. Jane Carruthers argues that environmental historians are well equipped to raise questions related to environmental and social issues particular to emerging countries such as South Africa. Jane Carruthers, “Environmental History For An Emerging World”, Conservation and Society (2013), Download from the journal’s website. On 27 September 2013 the The Intergovernmental Panel on Climate Change (IPCC) published its highly anticipated summary for policymakers, in advance of its fifth assessment report that will be published in early 2014. This special episode of the podcast, explores briefly the origins of the organisation that produced this landmark report and, in more detail, the difficult international negotiations that have used the IPCC’s findings since its inception. This historical overview ends with the question whether we can learn anything from previous problems of atmospheric pollution, in this case the Great London Smog and the ozone hole, to tackle global warming. The podcast concludes with a brief interview of historical climatologist Dagomar Degroot and his response to the summary of the fifth assessment report from the perspective of climate history. Dagomar is a PhD Candidate in environmental history at York University in Toronto, Canada. Maggie Koerth Baker, “The value of talking about values. It’s time to be explicit about how our beliefs affect what we think should be done with the science of climate change“, Ensia, 25 September 2013. Jan Oosthoek, “The IPCC and the Ozone Hole: a Warning from History“, Globalizations, March 2008, Vol. 5, No. 1, 63-66. 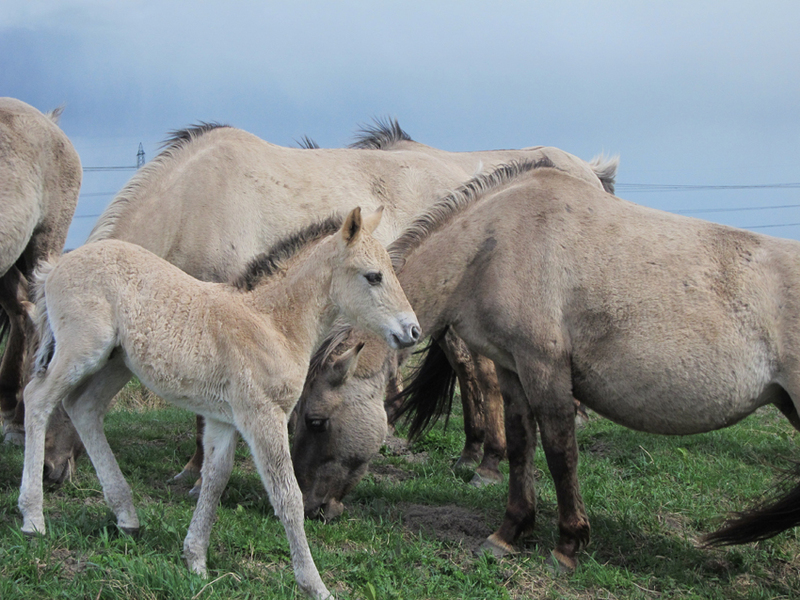 A foal in the Konik pony herd at Wicken Fen. It is undeniable that human influence is now felt in almost every ecosystem, region and ocean of the world. As a result wilderness or wild nature is becoming less abundant. In response to this less wild world, landscape and ecosystem restorations are undertaken all over the globe. One of these places is the wetland area of Wicken Fen in Cambridgeshire, England, where the National Trust is attempting a landscape scale restoration. This programme is not just about restoring but also “rewilding” the landscape. A big part of the Wicken Fen restoration involves the introduction of large grazers: Konik ponies and Highland cattle. In April a workshop was held at Wicken Fen entitled Desire for the Wild – Wild Desires? Re-wilding in a world of social, environmental and climate change. This workshop considered what “wild” and “rewilding” of nature means and what history can contribute to efforts to rewild and restore landscapes and ecosystems. New Popular Edition, 1945-1947, sheet 135. The guest on this podcast is is Dolly Jørgensen, a historian of Science and the Environment based at Umeå University in Sweden. Dolly presented a paper at the workshop on how rewilding has been an argument meaning different things to different academic sub-groups, all with a different historical notion of ‘when was wild’. Dolly deconstructs the different meanings of rewilding, and also follows the trail to find wildness all around us. This podcast is the first of two episodes exploring the Desire for the Wild – Wild Desires? workshop. William Cronon, “The Trouble with Wilderness; or, Getting Back to the Wrong Nature”, In: William Cronon (ed. ), Uncommon Ground: Rethinking the Human Place in Nature (New York: W. W. Norton, 1995), pp. 69-90. Josh Donlan, et al., “Re-wilding North America”, Nature, Vol. 436 (18 August 2005), pp. 913-914. Josh Donlan, et al., “Pleistocene Rewilding: An Optimistic Agenda for Twenty‐First Century Conservation”,The American Naturalist, Vol. 168, No. 5 (November 2006), pp. 660-681. Carl Elliot Smith, Rewilding: should we introduce lions and Komodo dragons to Australia?, ABC RN Radio, Wednesday 3 July, 2013. Listen also to Future Tense to find out more about the strand of conservation theory known as rewilding. George Monbiot, My manifesto for rewilding the world, The Guardian, 28 May, 2013. Also listen to episodes 38 and 40 of Exploring Environmental History Podcast. Both explore the Wicken Fen Vision and the history of the Fens of Cambridgeshire. The Places that Speak to Us Project and the production of this podcast was funded by the AHRC Landscape & Environment Programme. Antarctica is a unique continent because is mostly covered in ice and, importantly, it is the only continent that has never been settled by humans until scientific bases were established in the 20th C. This makes it an international space which has implications for the environmental regulatory regimes that have developed over time as well as the way we view the continent. Without a popular tradition of natural history, or amateur ornithology, or locals dependent on wild resources from which a conservation ethic might emerge, it was trained, international biologists who led the development of nature protection and conservation in Antarctica. The guest on this podcast episode is Alessandro Antonello, a PhD candidate in the School of History at the Australian National University’s Research School of Social Sciences, in Canberra, Australia. In this podcast he explores the scientific, environmental and diplomatic aspects of Antarctic history, in particular from the inception of the Antarctic Treaty in 1959. He also examines changing conceptions of the Antarctic in the second half of the 20th century and places this in a wider historical context. Marcus Haward and Tom Griffiths (eds. ), Australia and the Antarctic Treaty system: 50 years of influence, UNSW Press, 2011.